Whether you’re an owner or a tenant, you’ve made a significant investment in your building. Owners want to ensure maximum return on their property investments. Tenants want work spaces that function well for their business, help them attract and retain great employees, and are a positive reflection of their brand. 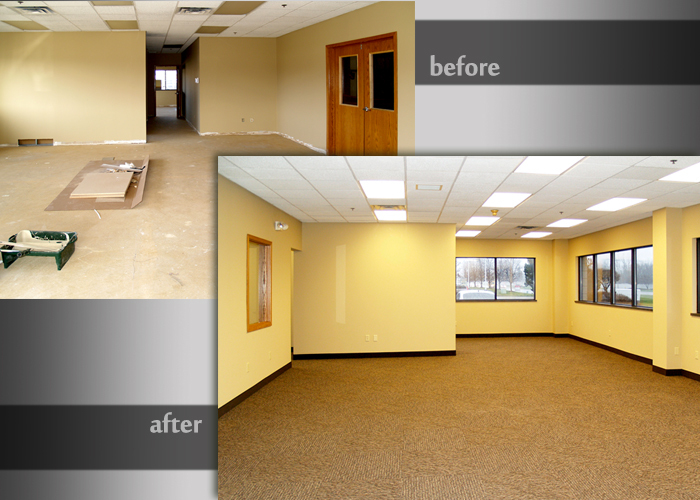 Over time, work environments can become a little “tired” looking and in need of a refresh. When it’s time to update fixtures, flooring, or put some fresh paint on the walls, call First Companies. We’ll work with you to determine the areas of greatest need and where you can expect the best ROI on your investment. The team will provide options and cost estimates, and ensure all work is completed within your budget. Investing in an office refresh improves employee morale, increases property value, and gives you a work environment you’re proud to invite customers to. Call us at 616.698.5000 to get started!